Candy, squeeze balls, pens, and key chains — these provide questionable value to anyone visiting or staffing a tradeshow booth. More and more meeting and marketing professionals are considering something a little different – booklets. They are a way to attract higher quality prospects, reap a handsome return on the investment of time and money in attending shows, and help set a company apart from the crowd. What is a booklet? The ultimate purpose of a booklet is to educate a target audience. It contains tips, techniques or strategies to help accomplish certain tasks. Typically it measures 3 ½” x 8 ½”, has 16 to24 pages, fits perfectly into a purse, pocket, or briefcase, and can conveniently be mailed in a standard #10 business envelope. The following five points highlight how you can use booklets as a powerful marketing tool to increase sales from tradeshow leads. 1. Why booklets make a great tradeshow giveaway item. Booklets have a lasting value, more than many handouts currently used at tradeshows. Yet booklets are not overpowering in any way. One major purpose in exhibiting at a show is to educate your target audience about how you can provide solutions to their challenges. A booklet packed full of a useful tips might address those challenges. In addition, it heightens your company’s credibility as an expert in the industry, and draws the prospect to you when it’s time to purchase. Your company’s name on a coffee mug or pen doesn’t quite have the same impact when a prospect is looking for solutions to their challenges. Rather when they easily read your information in a booklet, you’re perceived as knowledgeable. Also, you leave the reader with the distinct impression that you are looking to establish a rapport, and a business relationship with them. Handing out booklets separates you from those with a dish of candy at their booth, or those who offer yet one more shopping bag. And, the cost of booklets is less than many other giveaways and can effectively and easily be used throughout the year in other parts of your sales and marketing efforts. 2. Who uses booklets as a giveaway? Anyone in any industry who is selling or exhibiting at a trade show is a candidate for using booklets as a unique promotional tool. A company can write and produce their own booklet, have a booklet produced for them, or purchase copies of someone else’s booklet on a topic of interest for their target audience. Small, mid-sized, and large companies alike use booklets. The minimum purchases are usually completely manageable, and there is an economy of scale as you purchase larger quantities. 3. What kind of information to include in a booklet? The best information to include in a booklet is common sense, grass roots, basic, practical “how-to” content on a topic relevant to your business and important to your customers. The material can be solutions to everyday concerns, which people often overlook. Sometimes the “magic pill” answer to challenges turns out to be information that is known but merely forgotten. The booklet acts as a reminder. It can also serve as new information for novices to an industry. 4. How else you can use a booklet to market your company? Once you have produced a booklet, you can often find other organizations that can benefit from it. This then helps to recoup your production costs, should that be of concern. For example, a manufacturer could sell it to distributors. You also continue marketing your own company, and generate new revenue in the process. Other uses include direct mail campaigns or licensing the rights to your booklet to another company. Licensing might also involve translating it into other languages to reach additional markets. Licensing agreements mean that the client produces the booklet. Your company grants specific rights, by written contract, for the client to do all the production of the booklet manuscript that your company owns. Identify prospects in your own industry by looking at the vendors, suppliers, and manufacturers. Each is a marketing niche. Approach them in a common-sense way. Remember that you are providing solutions to many of your clients’ problems. 5. What common mistakes do companies make when exhibiting? One of the biggest mistakes companies make when exhibiting is in repeating what other exhibitors are giving away, or repeating what the company has done year after year regardless of the results. An uninteresting handout makes the statement that a company has put limited thought into their clients’ needs. The importance of educating the clients about how you can help them cannot be overstated. When your company makes one more sale because someone reads the booklet you gave them, the investment of purchasing or creating the booklet pays off handsomely. Getting a return on the overall investment of the tradeshow is ultimately the primary reason for attending the show at all. Some industries, such as the pharmaceutical industry, are now making a concerted effort to pull back on money spent on excessively expensive and inappropriate giveaways, and are turning toward giveaways with educational value. Using a booklet as a tradeshow booth giveaway creates magic as you enjoy better-qualified leads that produce larger sales over a longer period of time with well-educated clients. A small investment in the booklet is definitely worth the large return. Written by Susan A. Friedmann,CSP, The Tradeshow Coach, Lake Placid, NY, author: “Meeting & Event Planning for Dummies,” working with companies to improve their meeting and event success through coaching, consulting and training. For a free copy of “10 Common Mistakes Exhibitors Make”, e-mail: article4@thetradeshowcoach.com; website: www.thetradeshowcoach.com. The tradeshow floor is a unique place. It’s artificial and unreal. Thousands of people are darting about the show floor, all with different agendas and schedules and goals. So how do you communicate in such a wacky, upside-down environment? First, remember YOUR goal(s). If it’s to qualify a prospect, keep that at the forefront of your mind. If your goal is to make a sale or gather leads, keep that present. Second, you have a limited time to assess whether your prospect fits your goals. And third, once you have completed your goal, move on to the next person. So how does this work in the real artificial world of the tradeshow floor? The first – remember YOUR GOAL – must take place before the show opens. This is usually a simple statement or understanding of your company’s reason for being at the show. And remember that your company’s goals may change from show to show, depending on the nature of the show and the attendees. One horizontal industry show might demand that you just gather leads. Another more vertical show might lend itself to racking up sales. So if your stated goal is, for instance, ‘qualify prospects and determine if they’re in the market for our product or service in the next 90 days,’ you’ll just keep that in the forefront of your mind. It doesn’t mean that you ignore people that don’t fit the profile. In fact, you may want to gather those leads and keep them separately. If you’re averaging 7 to 12 visitors per hour per person, that gives you approximately 5 to 8 ½ minutes per person during the time each person is engaged in a conversation. That may seem like a lot, or it may seem like very little time, depending on your context. For most sales people who like to sit down and engage a prospect and really uncover their needs with question after question, it would seem like a short time. Now that you know what your time frame is, it helps you approach the encounter with the booth visitor knowing what you want to accomplish. First, you’ll want to find out who they are. Chances are they’re wearing a name badge. Next, determine what they do for the company. Even if there’s a title on their badge, it’s appropriate to ask what kinds of things they do on the job. Use these questions to break the ice with them. Next, you’ll want to find out how your product can help them. It will help you immensely if you go over a handful of potential opening questions before the show. Rehearse them with your co-workers. Now that you’ve asked the question, STOP TALKING and LISTEN! Don’t stand there trying to think of your next question or statement or sales pitch. When you listen, really listen, to the prospect, it gives them a chance to give you information which will mostly likely be useful to you. What they say will determine your next statement or question. If they’re interested in your product, it’ll show. If not, you’ve disqualified them. So here’s the third part of communication on the tradeshow floor: politely disengage and move on to the next attendee. Even if they are a hot prospect, chances are you’ll want to just get their information and talk to them after the show when you’ll have a chance to expand your conversation and find out how you can really help them. Of course, in the real world you may find that it’s important to spend a much longer time with the prospect. It may make sense to go into their situation in much greater detail – you’ll have to use your judgment on that. You might be able to meet them at a later time during the show when you’re not on the show floor. Bottom Line: keep your communication pointed, specific, friendly and upbeat. You have a limited time to gather your critical information. Once you have done that, make sure you follow up back at the office! If you’re exhibiting at a show that attracts 30,000 visitors, how can you calculate – within a reasonable margin of error – how many of those 30,000 will actually come to your booth? Well, it’s all guesswork. But at least it’s educated guesswork! The most recent information I’ve seen suggests anywhere from 7 to 12% of the entire audience at a show is going to potentially visit your booth. Let’s say you’re planning to exhibit at a show that attracts 30,000 visitors – that means your potential audience is 2,100 to 3,600 people. But only about 80% of the potential audience will see your exhibit, and only about 45% of that number will stop and engage with your staff. So let’s go back to the example. If your ‘potential audience’ is 2,100 to 3,600 and only 80 percent of that number will see your booth that puts the number between 1680 and 2880. With that you can plan on seeing anywhere from 945 to 1620 people who will stop at your booth. So if you take the number of hours and divide that into your potential audience, you can calculate approximately how many people will visit your booth on an hourly basis. Let’s say the show lasts 3 days, and runs from 10am to 5pm each day. That’s a total of 21 hours, so you should have about 45 to 77 people visiting your show per hour. Of course, some hours of a show are busier than others, but with those numbers, you have information at your fingertips that can help you determine a number of things: how many people you should have staffing the booth, how many ‘lead sheets’ you should have available, how big your booth should be, even how often your staff should be able to take breaks. If for some reason you have run the numbers and found out at the end of the show that your numbers are way off (say, way down) from what you had anticipated, look at some of the variables that might have affected that. Some you can control, others you can’t. You CAN obviously control the ‘look and feel’ of your booth, its attractiveness and the graphics. You CAN’T control the look and feel of booths around you, or what your fellow exhibitors are using as enticements or promotions. You CAN control how your staff interacts with attendees, how well-trained they are at gathering leads and qualifying visitors. And keep this in mind: a rule of thumb is that you should have two staffers for each 100 square feet of booth space, even with demo stations, tables for client meetings, etc. So, do the math, and determine how big of a space you should really have – and if that fits in your budget. Naturally, budget rules everything. But if you have very strong information that suggests your booth should be bigger (or even smaller) than what you’ve been using, you can make those adjustments internally over time. It’s been said the best way to learn about tradeshows if you’re new to the industry, or new to the experience, is to attend one or two shows before you attempt to organize or handle the actual booth. So DO IT! Spend a few days. Get there early and watch the set-up, booth designs, and stick around for the tear-down, too. 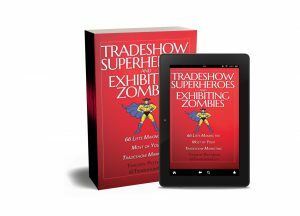 It’ll help you get a look at the strategic behind-the-scenes planning and an overall feel for how tradeshows work. When it comes time to actually display, many small companies vying for attention have found that it makes more sense to invite the buyers to come by booth and set up appointments. With thousands of people streaming by your booth over the duration of the tradeshow, it’ll give out a much better impression if you look organized. If you look disorganized, how will you convince a potential buyer or distributor that you can deliver the product? Before adding a show to your exhibit list, you might strongly consider attending as a visitor, which will give you a good sense of who is there, who your competition is and who’s on the guest list. With the large number of shows that can touch on your industry, or even your niche of your industry, it’ll help you determine which shows are right for your company. Look at tradeshow marketing as just one prong of your marketing efforts. No smart marketer will put all his eggs in one basket. But spending time at a tradeshow either as an exhibitor or a visitor is a great way to meet a large number of potential customers and business partners in a short period of time. It’s a compressed experience: your time is compressed and the amount of people you can meet is also quite compressed. The key to success whether as a visitor or exhibitor is to be over-prepared. Know who you’d like to meet, know what companies you want to see, whether as a competitor or as a potential business partner or customer. Do your homework before you leave for the show, and spend a little of your down time in your hotel room updating and making notes. It’s all about taking control. Take control and you’ll be a success! There’s nothing quite like being the one booth in your aisle that’s grabbing all the attention – whether it’s from the food you’re giving away, the demo you’re giving, or the pseudo-celebrity signing autographs. Try a few of these ways to get more attention for your next show! 1. Pre-show promotion. Target your market, send them a clever promo piece with enough value so that they feel compelled to stop by your booth. One of the most famous in recent years is the company that sent one very nice glove and said the other one was waiting for them at the booth when they stopped by. Another approach would be to offer a high perceived-value premium gift to the prospect when they stop by – something that the normal tradeshow attendee won’t get. 2. Offer good food. Now of course this depends on the show and the rules at the show. At a Natural Foods Products show, of course, everybody’s offering food, so at those shows this may not be the best way to stand out. But at a tech show? Fios, Inc. of Portland, offered smoothies at a tech show – and had people lined up for much of the show. The Catch? Attendees couldn’t get a smoothie until they had their badge scanned. 3. Unusual or Extreme Demos. Self-defense weapons maker Taser offered to shock attendees. Hundreds took up the offer and ended up on the floor – some taking up to ten minutes to recover. One company selling a fire and trauma survival blanket had a company executive walk through a fire wearing the blanket. Microsoft once handed out nearly a thousand pocket PC’s and randomly sent out a messages on MSN Messenger. The first 100 people to find the mystery woman’s location received a token and a chance to win a pocket PC. 4. Re-think your Strategy. Why are you at the show? What is the purpose of your exhibit? Are you looking to sell products or focus on the company’s brand? By asking these kinds of questions – starting from scratch in the whole planning process and questioning all previous assumptions – you may find that your tradeshow booth needs a complete makeover. Or not. Maybe you’re doing everything the way it should be done – you just need to focus on execution better. 5. Fix the Mistakes in Your Graphics. If your booth graphics take more than a few seconds to read, you’re losing much of your prospective audience. Graphics paraphrase…the conversation you engage in will explain. Fix the text: show benefits to your prospect, don’t brag about awards your product has won. No one cares except the guy who created the product! Don’t use clever, artsy fonts; don’t use too small of type; make sure your background and foreground text have enough contrast so that it’s actually readable! Get your text up off the floor by at least 4 or 5 feet – people don’t want to read anything below eye level. Also keep graphic clutter down to a minimum. Use these rules: Simplicity Sells; Clean Design Attracts. 6. Ask the Right Questions. Once the visitor has been attracted to your booth with the right graphics and ‘look and feel’ of your booth, engage them in a short conversation. Asking the right questions means quickly qualifying the person, finding out what their needs might be in regard to your product, answering any questions they have and getting all the information necessary for prompt follow up. Then move on to the next person. 7. Hold a Media Event. IF –and it’s a big if – you have something new to offer or unveil, holding a media event will draw interested parties and experts out of the woodwork. Don’t just bring in your company officers. Ask some well-known industry folks and observers to attend and chime in with statements on your behalf. If they offer observations as to why the new thing is important and the industry should sit up and take notice, they usually will. Also make sure your hot prospects are a part of the event as well. But one caveat: unless you really DO have something new, don’t do this, it’ll annoy the press and you’ll waste your money. 8. Offer To Introduce Them To Someone Special. If people know they are going to meet someone they really want to know, they’ll have a big incentive to show up. It could be an industry bigwig, a local politician, a sports celebrity. Most celebrities can be hired for a day for a fee, if they’re available. If you found out your biggest prospect was a huge fan of some retired baseball player, and you hired that player for a few hours – don’t you think your prospect would walk on fire to get to your booth? Depending on your budget, you may be looking at someone local of note. Some celebrities are quite reasonable, others are outrageously expensive. Don’t forget to figure in travel and lodging expenses. 9. Offer an Ethical Bribe. Autographed merchandise has a high perceived value: baseballs, basketballs, books, etc. Or get an autographed artwork or a football signed by a major star from your hot prospects home town. With a little sleuthing you should be able to determine what will hit the prospect’s hot button. Then it’s a matter of footwork – and sometimes cost – to get the autograph on an item. Sometimes its just a matter of contacting an entertainment agent in your town and letting him know what you want. Rule of thumb – whatever you offer, it shouldn’t appear to be a bribe. Lots of companies have rules prohibiting their executives from accepting articles worth more then $50. The PERCEIVED VALUE is what’s important. Podcast Interview with Ken Newman, Magnet Productions in San Francisco. Ken has been doing tradeshow presentations for 25 years, and just recently returned from a big show where, lo and behold, traffic was great and his client brought home more leads from last year. Ken’s a terrific, talkative guy and discusses what it takes to put on an effective tradeshow presentaiton. And to think we met on Twitter: Ken Newman on Twitter and IE’s TradeshowGuy on Twitter. When Do You Need A Tradeshow Consultant? Does your company need a tradeshow staff trainer? A tradeshow is NOT a regular sales call. On the hot, active floor of the tradeshow, you must be quick on your feet, flexible, inventive, direct, creative and engaging. And you must know your product, your company, and your Most Important Prospects. So how do you tell if your tradeshow sales crew could use a tradeshow training specialist? Are you having a hard time defining what a good lead at your show really it? You’ll have a lot of lookers, passersby as well as clients and prospects. If your sales staff doesn’t have the skills to differentiate between the various people that are there, you may be wasting time and energy chasing the wrong people, or missing important time with current clients or good prospects. If your prospect has shown in interest in your company, has the bucks to work with you and you’re able to solve her problem – you have a good lead. Are your leads being sorted out into A (hot), B (warm) and C (cool) leads? If you’ve asked the right questions at the show, you’ll know exactly when the prospect wants you to follow up, and how. Some companies want immediate follow up, others are not ready to hear your presentation for a couple of months. Based on your company’s sales cycle, determine your categories of hot, warm and cool. Does your on-floor sales staff know the difference between tradeshow selling and ‘normal’ selling? At least what’s normal for your company? Do they know how to attract a prospect’s attention in five seconds or less with an engaging question? Do they know how to qualify, disqualify and gather proper information for the sales team back at the office? Do you have a list of pre-qualified prospects primed to see you at the show? Have you done pre-show marketing and made personal contacts to make sure your prime targets are attending and are planning to come see you? Do you have a system in place to trade lead follow-up? After the leads come back from the trade show, the sales staff needs to be able to show you how they’ve followed up, what the status of the contact is, and if the lead was a quality lead. By regular checking you’ll be able to determine if your trade show sales staff were actually qualifying the leads, or just scanning badges. Are you constantly ironing out inefficiencies in your system? This means regular de-briefings with your trade show sales staff to find out what works and what doesn’t. It means find out if your technology is doing all it should. It means reviewing your methodology for handling leads, putting on the trade show, updating your booth and more. It means going over your budget regularly with a fine tooth comb to weed out unneeded or ineffective items. Trade shows are not a regular sales event, it takes the right staff and the proper training to insure you’re getting the level of success you should. When you bring in a trade show consultant your trade show investment can really pay off. Contact us at Communication One Exhibits if you would like to find out more details.